What does the future hold for Nigeria’s Super Eagles? I was re-reading something I wrote about Brazil and how their latest crop of players could offer them some hope going into the World Cup in Russia and later tourneys when it dawned on me: I am not Brazilian, I am Nigerian. This mini-epiphany was prompted by the t.v suddenly going off and the fan above slowly grinding to a halt at the whim of a NEPA official somewhere. Nigeria has failed to qualify for a second consecutive AFCON since winning it in 2013. In this run, they lost to Sudan (A) & Congo (H), and drew with Tanzania (A). No disrespect to these nations but our heroes past would be rolling in their graves at these results. We’ve now been drawn in arguably the toughest group in all of World Cup 2018 qualification. Against 2012 AFCON champions Zambia, power house Cameroon, and Africa’s 2nd ranked team and 34th in the world Algeria, boasting the likes of PFA Player of the year Riyad Mahrez, his teammate Islam Slimani, Yacine Brahimi, etc. Sitting 64th in the world and 14th in Africa, things don’t look too bright for Nigerian football and its fans which is why physicians treating some hypertensive fans would often say “Please don’t watch Nigeria’s matches”. 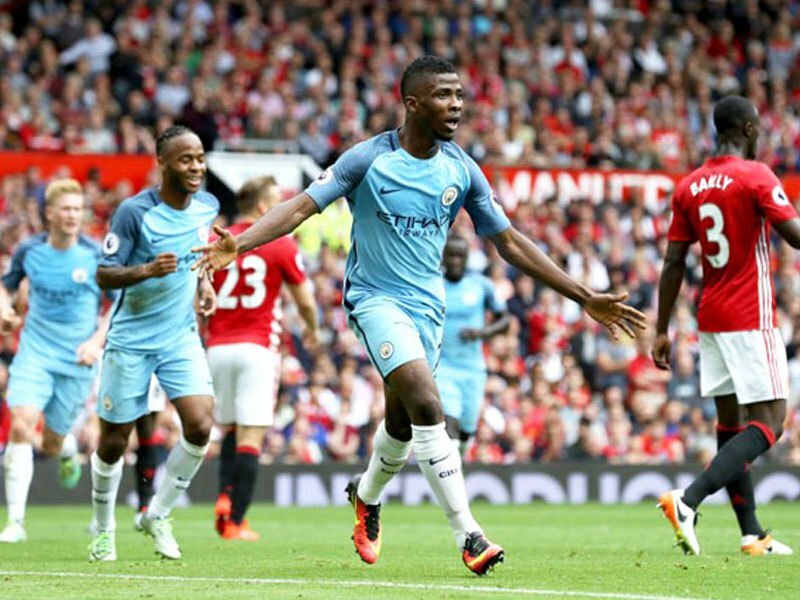 Man City & Super Eagles forward Kelechi Iheanacho celebrates his winner at the Manchester Derby. There is some hope though, for the future of Nigerian football. We now have more Nigerian players at top European clubs – not just on the fringes but actually impacting their teams. Odion Ighalo, although currently struggling for goals, is a lethal forward for whom Watford happily rejected a £37m bid. English Champions Leicester City paid a then club record fee to sign Eagles vice-captain Ahmed Musa. He’s yet to justify his move from CSKA Moscow though. Kelechi Iheanacho’s form for Manchester City has seen him labelled as City’s answer to United’s Marcus Rashford. He’s been so impressive that former manager Manuel Pellegrini trusted him with a UCL semi-final at the Bernabeu and new boss Pep Guardiola had no qualms starting him in the Manchester derby in place of the suspended Aguero. 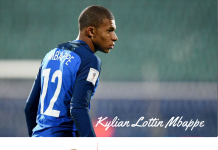 He has grown steadily and could become an integral part of the Super Eagles. 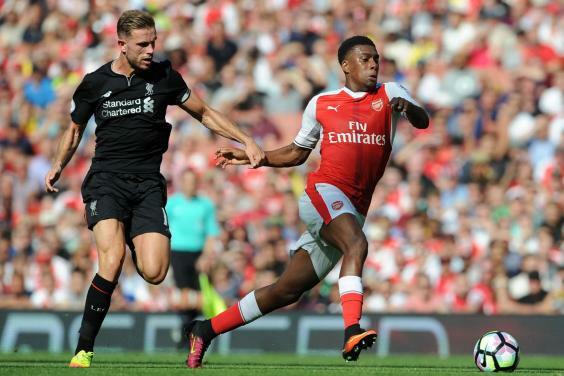 Arsenal’s Alex Iwobi vs Liverpool. His impressive rise through the ranks this season was hampered by an injury. Meanwhile Nigerian legend Jay Jay Okocha’s nephew continues to show that football skills might indeed be hereditary. His 3 assists in 4 EPL matches has seen him rise in Arsenal’s hierarchy above Alex Oxlade-Chamberlain and Joel Campbell. Moses Simon was a key component as Gent claimed their first Belgian Pro league in 2015 and has featured regularly for them ever since. Nigeria’s Oghenekaro Etebo scores vs Japan at the Rio 2016 Olympics. Our next Oliseh perhaps? 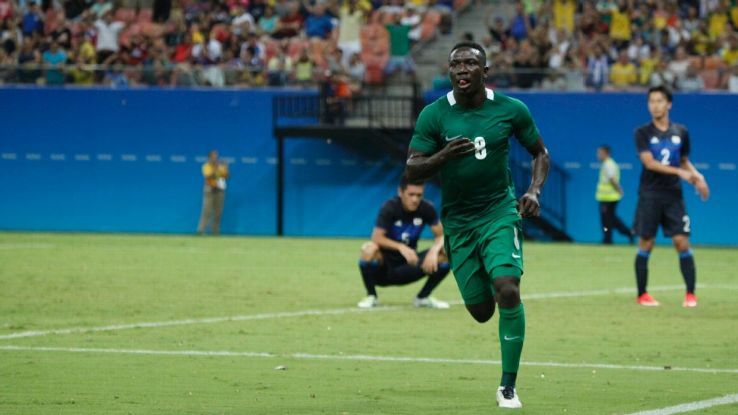 Oghenekaro Etebo – He smashed 4 goals past Japan in the first game of Rio 2016. He also holds a joint record for the most goals in a debut NPFL season. His 17 goals from Midfield has drawn comparisons with Frank Lampard. Sodiq Umar – He came into limelight by scoring 7 minutes into his full Serie A debut for AS Roma. He netted 4 times for Nigeria’s U23 team as they claimed a Bronze Medal in Rio 2016. Isaac Success – signed from Granada by Watford for a reported £12.5m after an impressive 2015/2016 campaign with the Andalusians. Victor Osimehin – signed for Bundesliga outfit Wolfsburg. His 10 goals at the 2015 FIFA U17 Championship made him one of the most coveted youngsters in the world. Others include Taiwo Awoniyi who signed for Liverpool in 2014, Musa Muhammed, Imoh Ezekiel, Kingsley Madu and William Troost-Ekong. Tottenham Hotspur’s Dele Alli celebrates scoring his sides third goal during the Premier League match vs Stoke. He was voted PFA Young Player of the Year 2016. 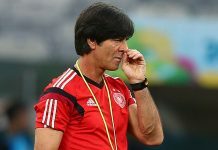 Gabby Agbonlahor, David Alaba, Dele Alli, Ross Barkley, Oguchi Onyewu, Denis Aogo, Angelo Ogbonna, Karim Osinowo, Hal Robson-Kanu and Jordan Ibe are all players who could have improved the national team, but we lost them to other nations and we are in danger of losing many more. Hardly an EFL cup match goes by without a Nigerian name in the squad of a top side. Sheyi Ojo, a player highly rated by the Liverpool youth coaches is just one of a number of players that are eligible to play for Nigeria but have their hearts set on representing England. Chelsea’s Dominic Solanke is one of England’s top talents and was Chelsea’s Academy player of the year in 2015. The 2016 award went to another Nigerian, Fikayo Tomori who represented England at the youth level but is also eligible to play for Canada. Tammy Abraham, who starred in their UEFA Youth League triumph and has netted 7 times in 9 appearances for Bristol City in the English Championship where he is currently on loan, is also eligible to play for Nigeria. Ope Aina rounds up the Chelsea Nigerian-English delegates. 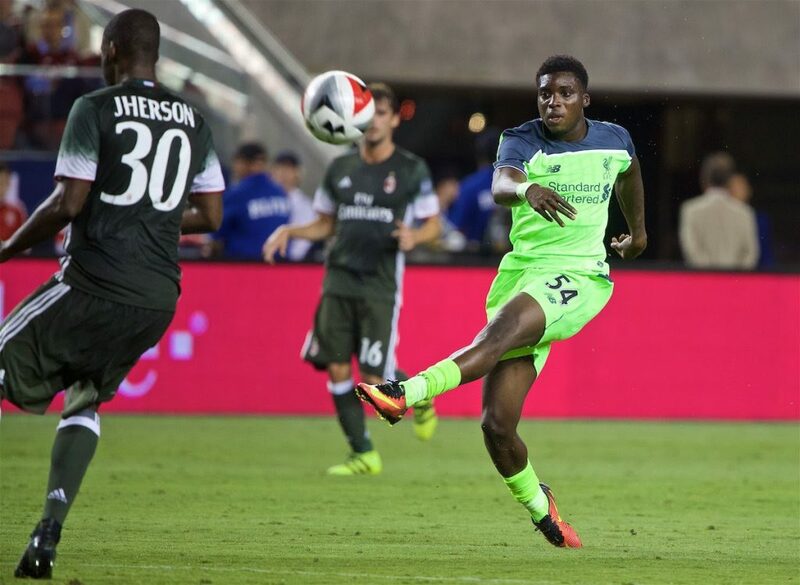 Liverpool’s Sheyi Ojo vs AC Milan: International Champions Cup 2016. Fisayo Adarabioyo was unable to break through the Man City’s youth ranks and eventually settled at NAC Breda. His brother, Tosin, was touted by Guardiola as a player to watch and has featured for the senior side in a number of pre-season friendlies. The imposing centre-back captained the Citizen’s U18 squad at 16 and has represented England at youth level. It’s possible that Nigerian football has a future worth looking forward to if we can lure these gifted players the Super Eagles. I hope we achieve this soon so we can enjoy some great football and the Eagles can be super again! Previous articleBubbling Under: Meet Bundesliga’s Hottest Starlets?